This post is brought to you by Elijah White, Marketing Director at Olympic Moving & Storage. No one chooses to move their office out of sheer boredom. Relocating is no small task and it can become very challenging depending on the dynamics of your company. One thing all office moves have in common is the fact that, as a business, it is important you reduce downtime, improve efficiency, and keep the overall cost of the move as low as possible. In this guide you will learn the 5 keys of planning a successful office move. First things first. You need to take a step back and look at your business as a whole. You may be growing too big for your current space, downsizing to reduce overhead, or seeking an improved location. Finding office space in popular metropolitan locations is competitive — the more forward planning you can do, the better! And regardless of your situation, it’s important that you start by evaluating your operations closely. This allows you the opportunity to decide what will need to be moved, in what order, and where it will all be placed in the new location. Scan any paperwork that you don’t need and store it digitally to reduce the amount of boxes, go through storage closets and cabinets to take inventory, and plan a moving sale for anything that does not absolutely need to be relocated. The less you take with you, the less time and money it will cost you to move. Assign an internal project manager. If you have a go-to person to delegate all of the tasks and scheduling to it will make things much more simple. Make sure that all of your employees know the agenda at least 6 months prior to the move out date so they can prepare their departments and individual work spaces for a smooth transition. The larger your office is; the more time you will need to allow for planning. Once you know when and where you will be moving, take the blueprint of the new office space and map out where all of your inventory will be placed. Understand your unique IT and logistical challenges and use this as an opportunity to streamline your operations. Look into open seating options vs. private offices to weigh the pros and cons before deciding what is right for your business. Give every employee a copy of the finished floor plan. This should include location of employees, furniture, plants, and whatever else you plan on bringing to the new office. People don’t mind change as much as they mind surprises. Be an amazing communicator and don’t be afraid to ask for input. Even if you decide against a recommendation it is always good policy to allow your staff to be heard. This will result in less long term headaches and increased morale during the transition. The biggest obstacle is coordinating all the moving parts. If you are depending on contractors to finish construction, you should prepare for delays. This can be a huge problem if your lease is expiring and you have no place to go. A possible solution is to utilize temporary office space with a company like PivotDesk. Have a plan B in place before putting the success of your business in the hands of a property manager, real estate broker, or construction foreman. With your plan in place, and your new office planned out, it’s time to call the professionals. A professional office moving company will have the experience and resources to come in and handle the remaining logistical details. They will schedule third party vendors, protect your new and old offices from damage, and relocate your business in a safe and efficient manner. Hire a company at least 3 months before your move out date. There is a big difference between commercial and residential relocations so it’s important that you hire someone specializing in office moves. Do not let your employees attempt to move their office furniture and/or heavy boxes themselves. There are too many late-night infomercials about six-figure-settlements for employees injured at work. When it comes to choosing the right company, the lowest bidder isn’t always the best option. Pick the mover that you feel is most professional, has the highest quality of online reviews, and offers referrals from companies they have recently relocated. Get everything in writing and understand the moving terms in your contract to avoid any unexpected extra charges. You will want to hit the ground running when you get into your new space. Take care of details like the address on your business cards and letterheads ahead of time. One month before the transition is an ideal time to order new sales collateral. Don’t forget to update your phone ads, website, and social media profiles. Local SEO is strongly affected by the consistency of your business name, telephone number, and address across the internet so make sure you take the time to seek out and update your information on the web. Send an update to all of your vendors and inform them of your new address. Adjust your shipping and billing addresses promptly so that there is no confusion or lost mail. Send an announcement to your customer email list and include any anticipated down time dates. Again, amazing communication is key during this transition. 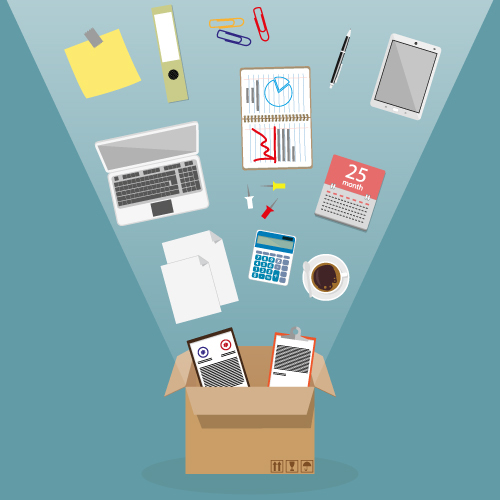 Moving your office can be hectic, but if you follow this simple guide your business should resurface stronger than ever! Looking for more insight on moving an office with ease? Download our webinar on structure a smooth office move now.